Planning your John Muir Trail hike may not be quite as much fun as actually walking the trail, but it can be a significant part of the enjoyment. If you’re a reader, learning about the mountains you are about to wander through can be fascinating. Here are five volumes you might want to add to your library. 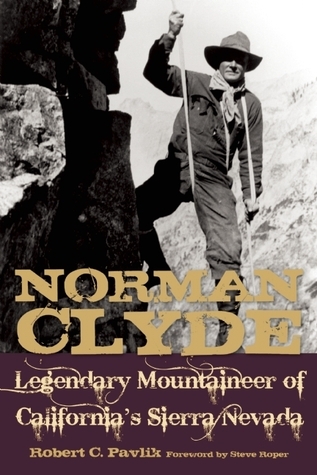 Norman Clyde: Legendary Mountaineer of California’s Sierra Nevada by Robert C. Pavlik. If there is anyone who knew the Sierra Nevada even better than John Muir, Norman Clyde is the guy. Clyde had over a hundred of first ascents credited to him, and was a key player in Sierra Nevada search and rescue before it was even called search and rescue. In 1920, he travelled the approximate path of the John Muir Trail, long before it was known as such, from Happy Isles to the Evolution Valley. You can’t read this book without concluding that men were made of sturdier stuff back then. 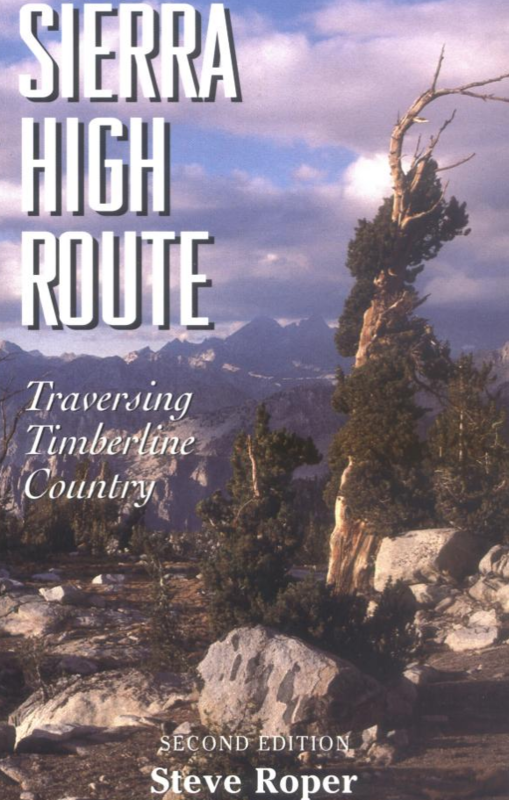 Sierra High Route: Traversing Timberline Country by Steve Roper. I don’t know if I’ll ever try this route, but I sure enjoyed reading about it. Roper’s text describes a hike – almost all of which is off-trail – that is extraordinarily difficult, and he has been accused by some of making it sound easier than it actually is. If you have ever wondered what it would be like to hike the John Muir Trail before there was any trail, this is probably as good an account as any. 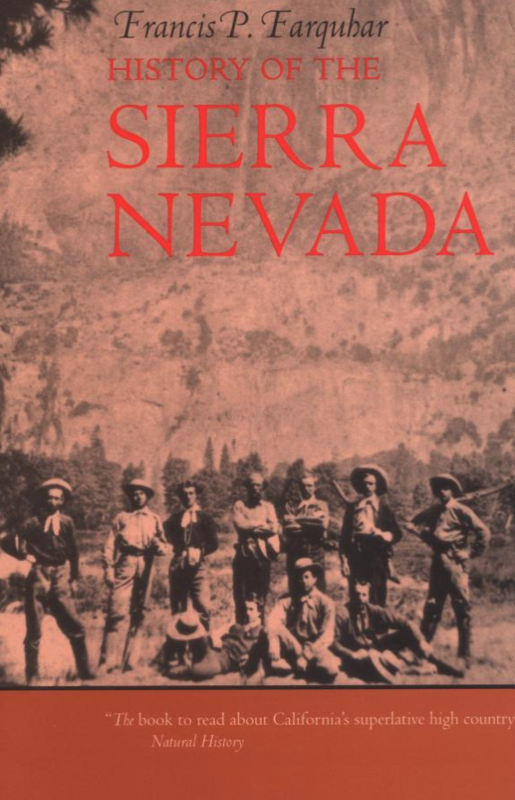 History of the Sierra Nevada by Francis P. Farquhar. This is one of my favorites. If you are only going to read one book about the Gentle Wilderness, this has to be it. Would you like to even enjoy this book more? Keep a good map of the Sierra Nevada near you while you are reading and refer to it often. 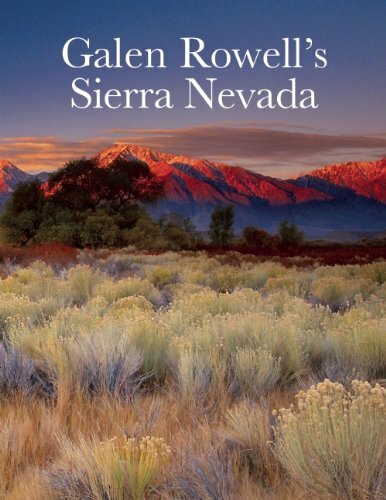 Galen Rowell’s Sierra Nevada by Galen Rowell. This book of gorgeous photography is hard to find – and will likely cost more than a few bucks – but it is well worth it if you are appreciative of the finest Sierra Nevada photography. As a photographer I am amazed by what Mr. Rowell was able to get straight out of his camera. These photos were made well before the era of digital photo editors, but were beautifully composed using a variety of neutral-density filters and, most of all, by getting his camera places where few could go. 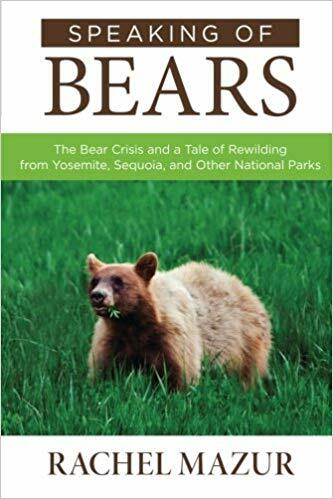 Speaking of Bears: The Bear Crisis and a Tale of Rewilding from Yosemite, Sequoia, and Other National Parks by Rachel Mazur. Ever wonder how we got to the point where we are all carrying our treats in bear-proof canisters? As you might imagine, it’s an interesting story. Mazur’s book covers more than just the Sierra Nevada, but after reading it you’ll never look at our ursine friends quite the same. 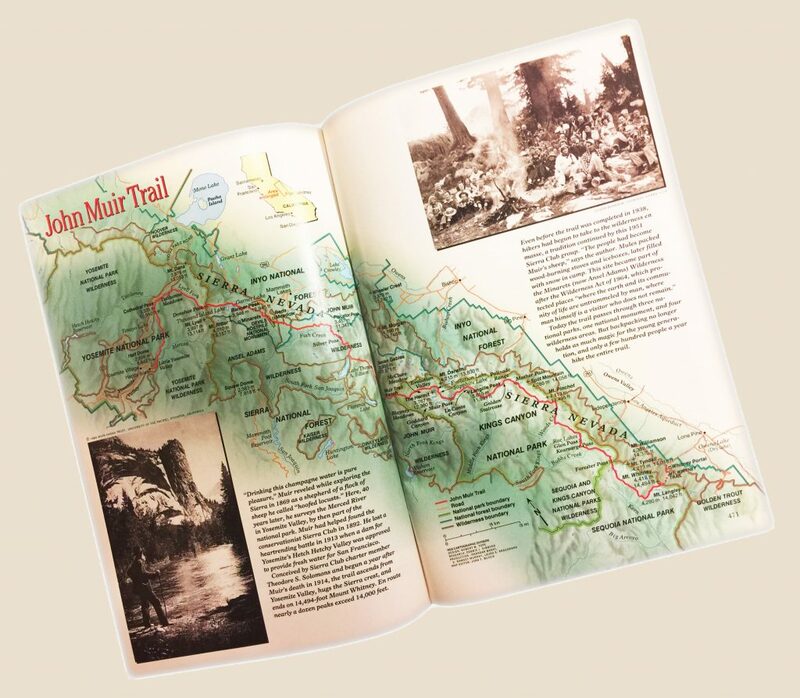 Elizabeth Wenk’s JMT trail guide has long been considered the best, and the fifth edition is even better! Hiking the John Muir Trail is a far more contemplative exercise than one might guess. Sure, it’s important to get the right shelter, sleep system, and water purification strategy, but the vast majority of your waking hours will not be spent in a tent or filtering water — they will be spent experiencing all that is the Sierra Nevada, from Yosemite Valley to the top of Mount Whitney. Hiking, like life itself, has its own hierarchy of needs: the higher you go up the pyramid, the happier you’ll be: water, food, and shelter may be necessary while you are out there, but they are far from sufficient. The fifth edition was released in 2014 and — to use a software analogy — it’s a major upgrade. I’m not a big fan of “Wish Lists.” I understand them, and even have one myself; there is something to be said for sacrificing a little mystery (I wonder what is in that package?) for some assurance that your gift will actually be welcomed. Still, I’m old-fashioned. I think there are few things better than seeing a friend or family-member open a gift that delights and surprises. If you have a hiker or backpacker on your list, here are five items I own that have delighted me over the years. Perhaps, among these, you will find a solution to one of your gift-giving puzzles. 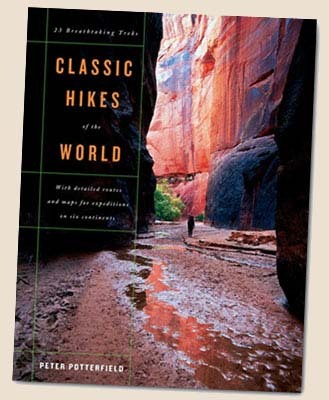 Classic Hikes of the World: 23 Breathtaking Treks by Peter Potterfield. I’ve owned this book for more than a decade and find myself re-reading portions several times a year. It’s a coffee-table book, but when I first received it I read it cover-to-cover. If you are looking to rekindle your enthusiasm for hiking in the middle of winter, there is no better place to look. 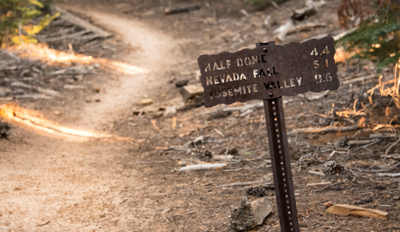 In case you were wondering, the John Muir Trail is the first trek described. 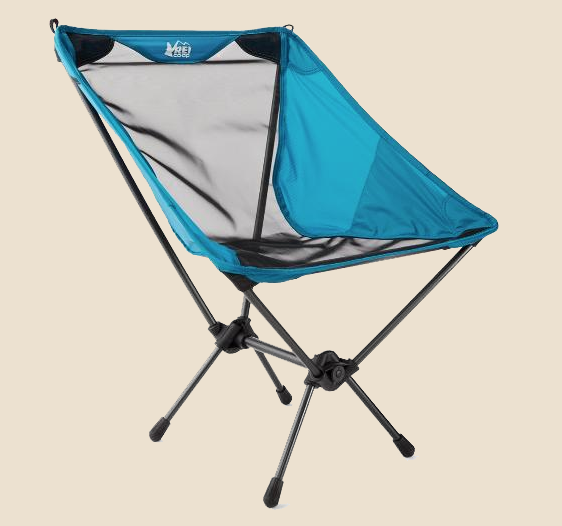 REI Flexlite Chair. I’ve sung the praises of this little guy before, and since then have bought one for my wife. Some of our best hiking memories are of us sitting side-by-side enjoying a meal and a view. Like everything in your backpack, this chair will force you to do a cost-benefit analysis. But, if you are of a certain age where sitting on log, a boulder, or the ground is hard on your back (and backside), you just might find the extra couple of pounds worth it. Check it out here. 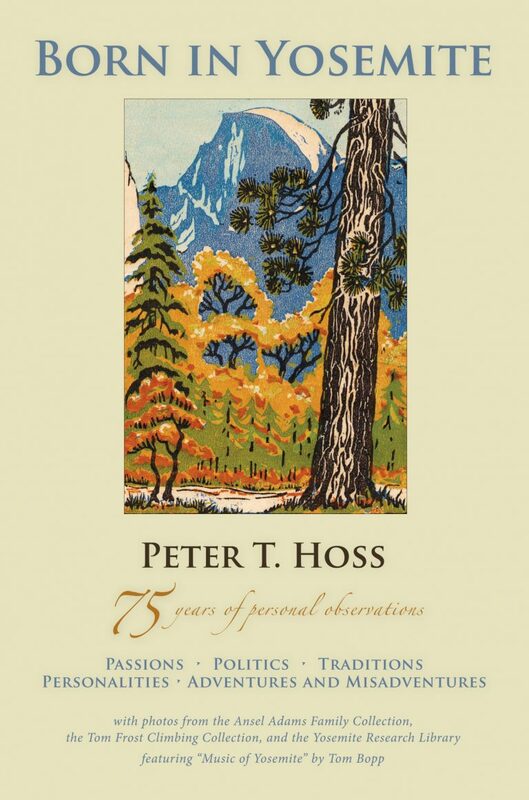 Born In Yosemite by Peter T. Hoss. Most John Muir Trail hikers fall in love with the Sierra Nevada before they fall in love with the trail, and many of those first experience the Sierra in Yosemite. This combination of memoir and history truly gives readers an inside look – both small- and big-picture – at Yosemite National Park and how we got the current mixed results in our attempt to preserve it. Mr. Hoss has an appreciation of this beautiful place that comes from a perspective few have. 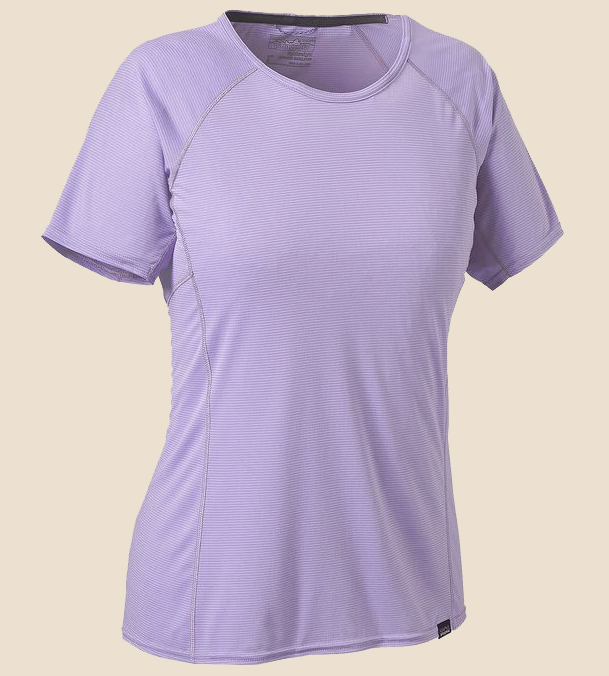 Patagonia Capilene® Lightweight T-Shirt. I’m no gym rat, but three times a week you’ll find me in our fitness center slogging through a aerobic & anaerobic routine. Over the years I’ve worn probably fifty different shirts. These days I’m down to three (one blue, one red, one green) Patagonia tee-shirts, made out of what was then called Capilene 1. For me, there is nothing better. 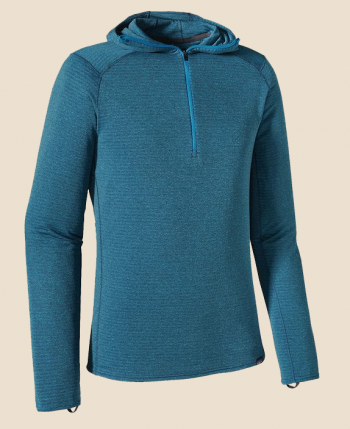 I actually bought these shirts for hiking more than a decade ago, and continue to wear them as an outer-garment on the trail in warm weather, or as a base layer in cooler weather. They are comfortable, light as a feather, and are tailored so that they don’t look like a potato sack with three holes cut in them. They seem impervious to wear. They come in men’s and women’s versions. Many of us who have hiked – or intend to hike – the John Muir Trail can’t quite get enough information about that glorious stretch of the Sierra Nevada. We have collections of books and magazines, new and not-so-new, that we like to amble through when we are unable to amble down the trail itself. If you are going to start your own collection, begin with John Dittli’s Walk the Sky. It is readily available at Amazon and, for those of you reading this during the holidays, it makes a terrific present for anyone interested in the JMT. If you are willing to dig a little deeper, consider hitting the internet (or a local used bookstore) for the April 1989 issue of National Geographic (volume 175, number 4). Look for the loon on the cover. Within its pages you will find an article by the writer, photographer, and adventurer Galen Rowell. For more than two-dozen pages he describes a mid-winter quest to ski and hike from the summit of Mount Whitney to Happy Isles. While Ansel Adams is doubtlessly the first photographer that comes to mind when one thinks of the Sierra Nevada, Rowell (1940 – 2002) is not far behind. And because he was an accomplished climber (he is credited with a number of first ascents), Rowell’s photos are often taken from a vantage point unreachable by Adams. If you are looking to kill a little time before or after your JMT hike, an hour or two spent at his Mountain Light gallery, in Bishop, California, would be time well spent. The article in the magazine is called, Along the High, Wild Sierra. There is a lot within it to enjoy, but I couldn’t help but smile at the fact that they travelled 160 miles on the trail without seeing anyone. It took them a little over two weeks to make the trek. Although the depictions of life on the trail in deep winter were interesting, Rowell’s account of how his mother, Margaret Avery, introduced him to the Range of Light, and inadvertently (or, perhaps, intentionally) set him on a path he would follow for the rest of his life were fascinating, probably because I, too, can credit my mother with introducing me to the mountains. Avery was quite the adventurer in her own right, and was the first to reach the summit of the Hermit, which towers over the Evolution Valley. If you can’t find an actual copy of the magazine, all back issues of National Geographic are available to subscribers. It has been seven years since I started hiking again in a big way, and I have learned a ton. That’s good, because I am no longer young enough to just “power through” my mistakes. Thinking-my-way along the trail is a far better approach. Here are my top ten lessons. If you learned most of these in your first six months, I guess that gives you some insight into the way my mind works—or doesn’t. 1. Weight matters. I don’t care if it is weight around your waist or in your pack, nothing improves the experience of hiking quite like carrying less. You need to stay safe, and you don’t want to shave so many ounces that you no longer are enjoying yourself, but weight DEFINITELY matters. Imagine if you lost ten pounds of body weight and saved another ten pounds with lighter gear. Do it. 2. Get trekking poles and learn how to use them. Nothing will end a hike faster than an injury and the number one way people get injured on the trail is from falls. My trekking poles have saved me from a fall more times than I can count. 3. Take long and more frequent breaks. If you see someplace idyllic along the trail, don’t rush past it! My first thru-hike I often pulled into camp between 3 p.m. and 5 p.m., then went to bed early. The second time around I took more and longer breaks. I got to my campsite later, but still in plenty of time, and with great memories of the places I stopped to enjoy. A nap alongside a babbling brook is a wonderful thing. 4. Your most important gear choice is your footwear. Wear what works for you, even if it is a little heavier and even if it bucks the current trends. Oh, and socks are part of the package. Here’s a tip: if you buy a pair of boots or shoes you are unsure of, wear them exclusively inside (perhaps at work) for a couple of days. Chances are you will be able to take them back if they start giving you problems. 5. If you are hiking with someone, work out how you are going to hike ahead of time. Morale is fragile on the trail, and can easily be damaged if one person’s expectations are different from another’s. Are you going to walk with each other, or go your own pace? What are your daily mileage goals? Work this out before you begin, and if you are hiking with your spouse, read this. 6. Take something to read on the trail. I love hiking in the Sierra Nevada, but by the end of the day, I am ready for a vacation from my vacation. Back in my sailing days, one of my favorite authors used to complain that he never understood why there were paintings of seascapes on the walls of boat cabins. His point was: if you want to see the sea, go topside and look at it! He much preferred landscapes. I feel the same way about reading material. No John Muir memoirs for me, after dark, in the tent; instead, give me a murder mystery in an urban setting. 7. The first priority when selecting food is bringing something you will actually eat. Rummaging through the hiking buckets at Red’s and MTR is always a lesson in human nature. Lots of people seem to consider a hiking holiday to be a good time to start eating healthy. What many folks don’t realize is how hard it is to eat enough calories to keep yourself going. You aren’t going to do that if you refuse to eat what you brought. Chocolate, nuts, sweets, pasta—whatever you will eat should be in your bear canister. Leave the kale and sugar-, gluten-, or fat-free stuff for after the hike. 8. If possible, take a zero day at Muir Trail Ranch. It isn’t always possible; reservations can be hard to get. But, for me, the very first date I set (upon which everything else depends) is my reservation at Muir Trail Ranch. The food is wonderful, the camaraderie satisfying, the bath facilities opulent, and, with a location almost precisely half-way along the trail, there is much to recommend spending two nights. 9. Don’t let the big climbs worry you. The climb out of Yosemite Valley? The first day energy will carry you through. The fifty-one switchbacks of Bear Ridge? Hike it early and you’ll be done before you know it. The Golden Staircase? Nothin-but-a-thing. Glen Pass? Okay…there you got me. I do wish they would install an escalator there. 10. Take photos and videos with yourself in them, and keep a trail journal. There will come a time when you are not going to be able to do this anymore. Don’t you want some great memories? Photos, videos, and a trail journal are the best way to memorialize your experience—to yourself. Sure, take a few of the “pretty” pictures so you can remember what you’ve seen, but then get yourself in there, too. Years from now, this will be pretty neat to see. Although I didn’t keep a tally during my 2013 hike of the John Muir Trail, it seemed to me that the vast majority of the hikers I encountered were carrying some sort of electronics. I don’t consider myself a heavy user, but I had five(!) items: SPOT personal locator beacon, GPS, cellphone, e-reader, and camera. My recharge strategy was to bring the chargers for my cell phone, camera, & e-reader, and spare batteries for the SPOT and GPS. The batteries and chargers weighed nearly two pounds. A much better approach would have been to bring a solar charger. 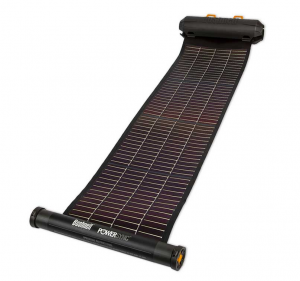 One of the newest on the market is the Bushnell PowerSync SolarWrap 400 Portable Charger. Although I haven’t yet got my hands on one, yet, it certainly looks interesting. Bottom line up front: it weighs just 10 ounces. Not bad for something that can deploy nearly thirty inches (by about six inches) of solar cells and can store the collected electricity within the integrated lithium-ion battery. What reviews I have been able to find have been very positive, particularly in regards to durability. Many also make the point that the charger seems to work pretty well on cloudy days. If you are in the Sierra Nevada during July, August, or September, you are likely to run into a few of those. If you have read Planning Your Thru-Hike of the John Muir Trail you know about the “gear triangle.” Gear can be cheap, comfortable (or, in this case, effective), or light—pick any two! In this case, the PowerSync is light and effective. It’s not cheap at $213.49 (Amazon). Many eschew electronics altogether; I have it from reliable sources that John Muir managed to see quite a bit of the Sierra Nevada without carrying an iPhone. Nevertheless, for folks like me, a few (or sometimes more than a few) gadgets really add to the fun of the hike. I might be convinced to leave my cellphone and GPS at home, but I wouldn’t think of thru-hiking the JMT, solo, without a PLB. I can’t imagine being without a camera. And if I left my e-reader, I’d have to carry a heavier book! I will definitely be trying one out, and if it proves to be the device Bushnell claims it is, and I can somehow get it to ride, open, on my backpack, it will be there when I depart Happy Isles. Hiking the John Muir Trail is a far more contemplative exercise than one might guess. Sure, it’s important to get the right shelter, sleep system, and water purification strategy, but the vast majority of your waking hours will not be spent in a tent or filtering water—they will be spent experiencing all that is the Sierra Nevada, from Yosemite Valley to the top of Mount Whitney. Hiking, like life itself, has its own hierarchy of needs. The higher you go up the pyramid, the happier you’ll be. Water, food, and shelter may be necessary while you are out there, but they are far from sufficient. The fifth edition has just been released and—to use a software analogy—it’s a major upgrade. Another improvement over the last edition is that it is a bit smaller. Previous editions had separate sections for southbound and northbound hikers, but the fifth edition assumes you are hiking south. I cringe at the thought of how many fourth editions were mauled by JMTers who ripped out the offending section in an effort to lighten their load. A fourteenth, bonus section in the book covers side trips to peaks and other scenic points. I’ve rarely ventured far from the main trail, but perusing this chapter has made me re-think that approach. During my next hike I intend to try a few of these trips. Ms. Wenk’s description of Tawny Point, on the Bighorn Plateau, is especially enticing. 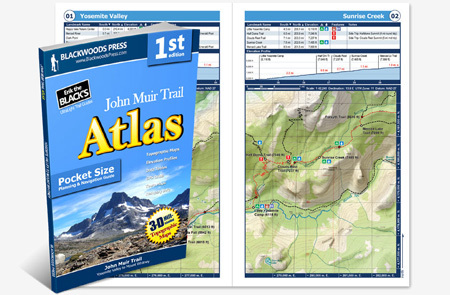 Ms. Wenk tells me that Wilderness Press intends to also sell a stripped down version of this guide—a “data book,” which would include just the maps, profiles, tables of information, and other critical information. If you are truly an expert in all things Sierra Nevada, that might be a good choice. 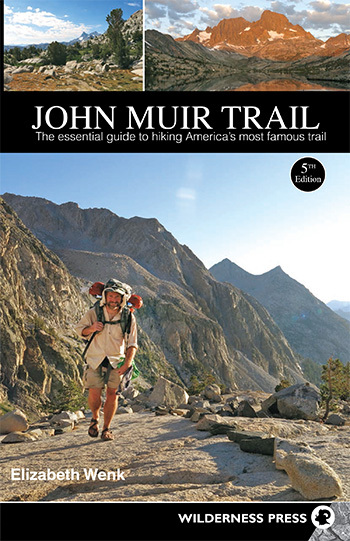 Hiking the John Muir Trail in 2014? Here’s what you should be doing now. If you’re planning to hike the John Muir Trail this year, you still have over six months before you begin (unless you intend to deal with lots of snow). Six months is not too early to start your planning. Here are ten things you can do, now. 1. Read about the trail. 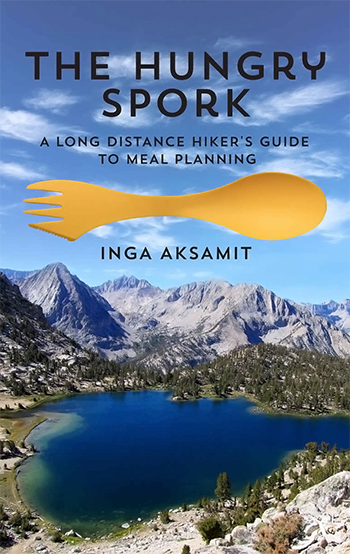 My recommendations would be, at a minimum, my planning guide and Elizabeth Wenk’s trail guide. 2. Settle on footwear. Are you going to wear boots, trail runners, or something else? Whatever you decide, you need to train in what you are going to wear on the hike. 3. Develop your training plan. This doesn’t need to complicated, but it needs to involve walking over uneven terrain (including as much uphill as possible) with a backpack.